Movie Ramble: Uncle Boonmee Who Can Recall his Past Life. 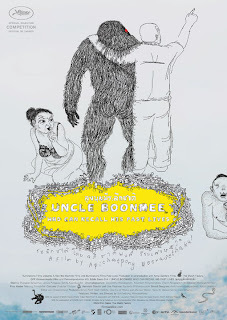 Uncle Boonmee Who Can Recall his Past Life. Directed by Apichatpong Weerasethakul and beautifully filmed on location in Bangkok and in the Northwest part of Thailand, Uncle Boonmee Who Can Recall his Past Life (2010) won the Palme d’or at the 2010 Cannes Film Festival and has been selected as the Thai entry for the Best Foreign Language at the 83rd Academy Awards. I’m really not sure about this movie, it caused me great consternation! Firstly I would admit that I found the experience soporific but the two-hour running time went very quickly! Secondly I found the narrative quite baffling but can’t get the movie out of my mind, perhaps a second viewing may be warranted to understand the intricacies involved in this story? The synopsis is as follows: Suffering from acute kidney failure, Uncle Boonmee has chosen to spend his final days surrounded by his loved ones in the countryside. Surprisingly, the ghost of his deceased wife appears to care for him, and his long lost son returns home in a non-human form. Contemplating the reasons for his illness, Boonmee treks through the jungle with his family to a mysterious hilltop cave – the birthplace of his first life. In the course of the film there’s many strange goings on, for example the fable about a talking fish seducing a princess beside a very striking waterfall, I’m not sure how this fitted into the rest of the story and to be honest I did tend to loose track of who was dead and who was alive? Unusual as it may seem I’m stuck for anything further to add! Over to you.